Q. How do I get started in the sport of competitive trail riding? A. The first thing you will want to do is check the websites of the various Competitive Trail Ride (CTR) organizations to find rides that are near you. Some of these organizations include the North American Trail Ride Conference (www.natrc.org), Upper Midwest Endurance and Competitive Rides Association (www.umecra.com), Eastern Competitive Trail Riding Association (www.ectra.org), Middle of the Trail Distance Riders Association (www.motdra.fws1.com), Southeastern Distance Riding Association (www.distanceriding.com), and Ontario Competitive Trail Association (www.octra.on.ca). Once you have found some scheduled rides near you, contact the organization for a set of rules and membership information. Becoming a member of an organization usually saves money on entry fees, plus they probably have an information packet for new members that will have helpful tips for getting started in the sport. A competitive trail ride is very different from a pleasure trail ride. Many newcomers to the sport are surprised by this. Something you might want to consider, instead of jumping right into competition, is to start as a volunteer worker at a ride. This will give you a good overview of how the rides are conducted. Examples of jobs that might be available: secretary for a judge, official timer, or member of a pulse and respiration check team. Another advantage of working at a ride first is that you have a chance to visit with the competitors in camp, see how they set up camp with their horses, and see all the various tack and equipment used on the trail and in camp. One more thing that can help a new competitor is a mentor. Many of the organizations, or even individual ride managers, will help you find an experienced fellow rider who will ride with you and coach you through your first competition. Just ask! Priscilla Lindsey, of Concordia, Kan., is a Horsemanship Judge for the North American Trail Ride Conference (NATRC) and a Centered Riding Instructor. 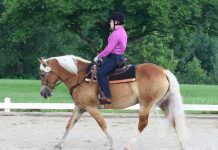 She started in the sport of competitive trail in 1981, after years of showing horses and enjoying pleasure trail rides. She enjoyed the sport so much that she started concentrating her horse breeding and training business on producing horses specifically for this sport. Priscilla and her husband, Steve, have enjoyed competitive trail in 19 states. They have raised and trained two National Champion competitive trail winners in both NATRC and Arabian Horse Association (AHA) competitions. 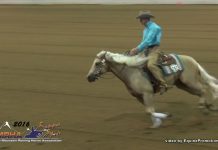 Several other horses from their breeding program have become winners, including the 2006 National Champion Half-Arabian in AHA competition. In addition to raising Arabian and Half-Arabian horses, and giving riding lessons and clinics, they also raise beef cattle and produce a variety of grain crops on their Kansas farm. Thank you so much for this article. I was wondering how to get started in competitive trails. My instructor has mentioned it a few times and has even offered me a chance to go a couple of times but I didn’t have the money to go. Thank you again. I can’t wait to go out there on trails this Spring! Some day I’d like to do CTR. But for now I enjoy Judged trail riding. It is much lower key and a ton of fun! good article. i’m very interested in this sport. this was a great article, i’ve been thinking about getting involved in commpetitive trail for a long time now and didn’t know what steps to take first, i now feel like i have all the right knowledge to make a good start . thanks! Hi, I represent ACTHA, American Competitive Trail Horse Association. We are an organization that has been around for 3 years and we are growing and need your help! Our goal is to make trail horses, more than just trail horses. We provide a scoring system that is kept on record to place more value on your horse no matter if it‘s registered or what breed it is. We give people the opportunity to enjoy their horses on a scenic trail with natural obstacles and a judge at each obstacle. Rides are typically 6 miles long, 2-3 hours. This also helps people bond with their horses, to learn to trust each other on the trail and enjoy friends and family on the ride too! The problem we are currently facing is not enough places to ride. This is where you come in or perhaps your club or organization. If you signed on you would be considered an Affiliate, as an Affiliate, there is NO cost to you what-so-ever, all we need is 6 miles of trail (or 300-400 acres) to have rides. We provide the help to have a ride, the insurance and you have fun and make money while you are at it. You have the opportunity to make money for yourself, your club or organization. I hope you can join us in making the Horse, More than Just a Trail Horse. To create an enjoyable venue showcasing the wonderful attributes of the Great American Trail Horse and granting them the recognition they so richly deserve. To create a registry open to all breeds and a point designation system which will stay with each horse for it’s lifetime, thereby adding to their value and distinction. To enable and initiate humane treatment option for horses. ACTHA and Cavallo Inc. (makers of the finest, safest and stay on eist!) trail boots in the world announce the joining of the two companies in a mutually supportive sponsorship. IF YOU WANT TO HAVE A WONDERFUL COMPETITIVE TRAIL RIDE JUST GO TO CHECK OUT http://www.nctha.com YOU WILL FIND A RIDE FOR YOU AND SOME WONDERFUL PEOPLE TO COMPETE WITH. Very helpful! I think I might want to get into competitive trail in the coming year or so. I only wish there were rides closer to me than 3 hours away. I would love this but I’m in Northeast PA and not sure if anyone around this area does it? If anybody can help me, I’d appreciate it! cool article! i wish that there were riding academys near me!